Anybody heard of The Malazan Book of the Fallen? Last edited by Epor on Mon May 17, 2004 8:57 am, edited 1 time in total. I'm giving the first two books as a present from me to me this Christmas. I hope it will be a similarly rewarding experience as David Farland last Christmas. <img src="i/expressions/face-icon-small-smile.gif"border=0> Nerdanel<BR><BR>I'm asking the first book, Gardens of the moon for Christmas as well. I get the impression these are very cool.<BR><BR>That will be a one book-filled Christmas, with <i>Storm of Swords</i> and <i>The Last Unicorn</i> "ordered" as well. 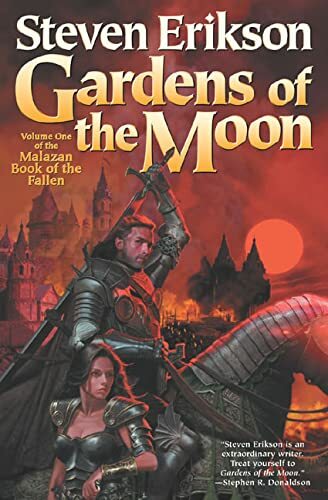 I've read Gardens of the Moon, which is the first book of Erikson's Malazan series. I found it to be an ambitious effort, but it certainly isn't the mindblowing experience that GRRM's ASoIaF is. The plot is very nearly as complex as Martin's, but Erikson's characters come across as somewhat flat and generic. Worth a read though.<BR><BR>Unlike Martin, who uses magic sparingly, Erikson's series is literally bursting with magical events. For those who like LOTS of magic, this may be the series for you. I'm on the fourth book in this series now, and it just gets better all the time. I wish he would hurry up with number five, but then again, I don't want to rush him. Yeah Midnight Tides isn't due out til March now. <img src="http://www.tolkienonline.com/mb/i/expressions/face-icon-small-sad.gif"border=0> The books are finally going to be published in the States some time next year, should get more Erikson converts after that. You mean they aren't out there yet?<img src="http://www.tolkienonline.com/mb/i/expressions/face-icon-small-shocked.gif"border=0> What's up with that? The guy's Canadian! Apparently the series was considered too complex and demanding for the American audience. <img src="http://www.tolkienonline.com/mb/i/expressions/face-icon-small-rolleyes.gif"border=0> This is the same kind of thinking that got Harry Potter and Philosopher's Stone renamed.<BR><BR>EDIT - Think of the oldbies! Don't change the smiley codes! Holeee... Now there's one I haven't heard before!<img src="http://www.tolkienonline.com/mb/i/expressions/face-icon-small-happy.gif"border=0> I'm not going there, but... YIKES!<img src="http://www.tolkienonline.com/mb/i/expressions/face-icon-small-rolleyes.gif"border=0> <img src="http://www.tolkienonline.com/mb/i/expressions/face-icon-small-happy.gif"border=0><BR><BR> Although I think he gets increasingly more complex by the book, I wouldn't think it should be a problem for anyone but the youngest readers. He's even made an effort to let people jump into the series in any of the books without losing much of the story. That takes some serious thinking. I seem to remember that it only came available on the US Amazon not too long ago, some time earlier this year maybe <img src="http://www.tolkienonline.com/mb/i/expressions/face-icon-small-confused.gif"border=0> Not sure how that worked. I don't think you get the kind of promotion for a book not actually in the store, certainly no impulse pick ups. Plus the stigma that if he can't get a publisher there, he must not be that good a writer. I'm not sure why there was so much trouble getting it to the States. He's been fairly popular for a couple of years now and talk of him getting a US carrier has been going on since I first heard about the series. I have read an interview with Erikson in which he said something to the effect that the suits in the US didn't like to admit they had been wrong about the books being too difficult for general audience, and that's why it had taken so long to get published there. Hmmm, suits don't usually let personal feelings get in the way of the all mighty dollar signs. Guess that's why they eventually gave in...<BR><BR>The T'lan Imass have the potential to be one of the greatest fantasy races ever. At first it seemed "oh yeah, more undead types, kinda cool and make them 300,000 years old so that makes em way cooler" but then Erikson gives them increasing depth. A whole people who have out lived their gods; the realization that as a race they have come to regret their decision, but have no easy way out; the twist of some of them doing exactly what the Tyrants had done to them in acting like gods; Onrack's childlike curosity mixed with unquestioning brutality and dry humor contrasted with the shock of his pivotal role in the shaping of the world. And Itkovian's role in their storyline is one the best parts of the series. Seems like time for favorite quotes <img src="http://www.tolkienonline.com/mb/i/expressions/face-icon-small-smile.gif"border=0><BR><BR>possible spoilers<BR><BR><BR><BR><BR><BR><BR><BR><BR><BR><BR><BR>From Memories of Ice:<BR><BR>The Tenescowri rose like an inexorable flood against every wall of the city. Rose, then swept over, a mass of humanity driven mad by hunger. Gate barricades buckled to the pressure, then gave way.<BR>And Capustan drowned.<BR><BR><BR>I am Fener's grief. I am the world's grief. And I will hold. I will hold it all, for we are not yet done.<BR><BR><BR>From House of Chains:<BR><BR>Another example of a creature that had hated him on first sight. Though perhaps the black rippled blade swinging at its head had tainted its response. Just mentioning that I have obtained a copy of book 5, Midnight Tides. I'm very excited, next to the new books by Kay (which is also out now), Martin (which hopefully will be released somewhere in this decade), Bakker and Williams, this is one of the most highly anticipated books to come out this year. Finished House of Chains just now, will soon start on Midnight Tides. Too bad Karsa apparently wont be in it. Only one quote this time. "Friends? L'oric, we were too powerful to know friendship. Our endeavours far too fierce. Our war was with chaos itself, and at times, with each other. We battled to shape all that would follow. And some of us lost that battle. Do not misapprehend, I held no deep enmity for you father. Rather, he was as unfathomable as the rest of us - a bemusement we all shared, perhaps the only thing we shared." This is perhaps the worst cover art I've seen this side of Darrell K. Sweet. I suppose that the guy on the horse is supposed to be Paran, but I'm not sure about the woman. If it's Tattersail, the artist has completely missed the fact that she's supposed to be plump. If it's Adjunct Lorn or someone else, I'm not sure why they would warrant such a prominent place on the cover. Started on Midnight Tides a few days back, and I'm happy to say my concerns that the story taking place on a different continent without any of the old characters present (well Trull Sengar is there, but he was introduced in House of Chains and wasn't particularly interesting) would make for a slightly disappointing read were unfounded. The opening is monumental to say the least. Hundreds of thousands Tiste Andii and Tiste Edur, led by Anomander Rake's younger brother and his Edur counterpart, fighting 60 000 K'Chain Che'Malle! Elder Gods and Jaghut in attendance! Not only does that cover have nothing to do with the book but it's ugly too. I never was sure who the cloaked guy with the lightning sword on the cover of Gardens... was supposed to be, but the "mood" of the picture seemed fitting somehow, and at least it looked ok. I've finally managed to get my hands on my library's edition of Midnight Tides, and am currently through 176 pages (out of about 690). The prologue, with the immense battle scene, is certainly truly spectacular, and really does set the scene well for the Tiste Edur storyline with its dark and heavy magic (the Lether-city storyline is good too, and I am so far appreciating the macabre humour, but currently I'm finding it less interesting). So far at least, Midnight Tides seems a step up from what I personally thought was a bit of a disappointing House of Chains. Epor: I always thought that that cloaked guy on the cover was Anomander Rake with Dragnipur. Though I will admit that it is fairly ambiguous. I didn't find House of Chains disappointing as such, though it does fall short of the brilliant previous Memories of Ice (best book of the series thus far, IMO). Karsa Orlong just doesn't leave room for disappointment. I like how Midnight Tides expands the world, taking place in somewhere no-one has heard of the Malazan empire, or of almost anything else we've come to be familiar with during the course of the previous books (though this is explained by more than just geographical distance). There are lots of new bits of information that help to explain things that happened in the previous books, for example, getting a glimpse of Gothos' power his son Icarium seems a bit less inexplicable. Just started Memories of Ice. Erikson's prose (though good) isn't as good as Martin's and his characters not so interesting, but his plot is very intriguing.